Ear infections occur when bacteria or fungi invade and infect the ear. 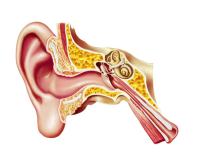 Middle ear infections, or acute otitis media, cause inflammation behind the drum of the ear, especially in the Eustachian tube, which connects the throat and back of nose to the middle ear. Ear infections usually happen quickly and can result in very painful earaches, fever, and difficulty hearing. Certain persons are at high risk for ear infection, including children who were exposed to alcohol or tobacco while in the womb, children who were not breast-fed, and children who are placed in day care. Ear infections can occur in the middle ear (acute otitis media) or in the ear canal. Middle ear infections are common in children (the Eustachian tubes of children are so small and may become clogged easily), though adults may get them as well. Untreated middle ear infections may cause a perforated eardrum, which may lead to further infections and structural damage in the middle ear. When the middle ear still has fluid in it after an infection has been cured, it is called serous otitis media. Chronic abnormalities within the middle ear are called chronic otitis media, and are often caused by a perforation within the eardrum, or a cholesteoma, which is a benign growth in the middle ear. Otitis externa, or swimmer’s ear, is a bacterial or fungal infection in the ear canal. When an ear infection spreads from the floor of the ear canal to the nearby tissues and bones in the skull, this is called malignant otitis externa. Malignant otitis externa may damage or destroy bones that are infected, and may spread to the brain or other cranial nerves. Though the condition is rare, people with diabetes and others with weakened immune systems may be susceptible to malignant otitis externa. Avoiding smoking and secondhand smoke may help prevent otitis media, as smoke tends to increase the risk of colds and thus the risk of ear infections. Additionally, some believe that breast feeding decreases the risk of otitis media in babies. To prevent otitis externa, it is recommended that individuals keep their ear canals dry to help reduce the risk of infection. For swimmers, this means tilting their heads to the side once they are out of the water to help drain excess liquid from the ear. If infection is common, it may be necessary to put cotton balls in a swimmer’s ears before they enter the water. Other solutions include mixing equal parts white vinegar and rubbing alcohol as eardrops to be used after swimming, which kills off bacteria and fungi on the outer ear. Earaches often occur after a person suffers from a nasal allergy or upper respiratory infection. Middle ear infections are usually caused by bacteria infecting the Eustachian tube. This inflames the Eustachian tube, which prevents it from equalizing pressure between the throat and middle ear. Pressure then decreases in the middle ear, and the result is usually an earache, the trapping of mucus and pus in the ear, and swelling. In turn, this clog muffles sound by preventing the three bones which normally vibrate from vibrating. Without this vibration, the ear is unable to send these signals to the brain. Ear infections may also be caused by frequent usage of ear plugs or hairspray. Otitis media is usually diagnosed by looking for fluid in the middle ear, and signs of redness or swelling. Other signs include fluid draining into the ear canal and if the lymph nodes behind the ear are tender. For otitis media, antibiotics are often used to clear up infections, and decongestants to clear the ear canal. Surgery is also an option for chronic ear infection sufferers. Unfortunately, traditional medicine often fails to effectively treat ear infections, and can be harmful to some children. Generally, if children are not allowed to fight the ear infection off using their own immune system, they may end up developing more infections and weakening their immune systems. In Europe, for instance, many physicians do not treat ear infections for up to two weeks, and try to see if the child will fight the infection off on their own. The doctor will only intervene with treatment if the condition worsens quickly or never really gets better after two weeks. Ear infections may be avoided early by making sure that expecting mothers do not use alcohol or tobacco products. Additional nutritious habits may also help prevent ear infections in their children. Children who are breast fed for six months tend to have fewer ear infections than those who are not. Children given cow’s milk too early in life may also have an increased risk of ear infection. Additionally, many doctors believe that one of the easiest ways of preventing ear infections in children is removing milk from their diet. Tests show that removal of milk from the diet prevents recurring ear infections in up to 50% of children. Once milk is removed from a child’s diet, the effect of reducing infections may take weeks or months to come to fruition. Other common allergens that may help trigger infection include wheat, soy, corn, and eggs. Homeopathic methods are also available for ear infections. Calendula or marigold may be put into an herbal eardrop and given to help relieve pain from ear infections. Other remedies include belladonna, ferrum phosphoricum, mercurius, chamomile (which helps with earaches that are caused by teething), hepar sulphurs calcareum, and kali muriaticum. For ear infections that are not serious, olive oil and crushed garlic may be used as an eardrop to alleviate pain. Chinese herbal medication may also be effective in treating ear infections. Minor Bupleurum is commonly used to treat ear infections in the East, and acts as an antibiotic. For most effective treatment, individuals should visit a Chinese herbologist to receive a specific formula of Minor Bupleurum which is catered to their needs. Consumption of omega-3 fatty acids may help treat ear infections, as these acids help to break up inflammation. Flaxseed oil is a good provider of these fatty acids. Nutrients which strengthen the immune system may also help persons avoid or treat ear infections. Recommended nutrients include zinc, beta carotene, ascorbic acid, and B-complex vitamins.